Kurt Herbert Adler Interview with Bruce Duffie . . . . . . . .
Kurt Herbert Adler, a Viennese-born conductor who led the San Francisco Opera for 28 years until his retirement in 1981, died of a heart attack Tuesday evening at his home in Ross, Calif., a suburb north of San Francisco. He was 82 years old. Mr. Adler's death followed by only a few hours the announcement that his successor, Terence A. McEwen, would retire because of acute diabetes. 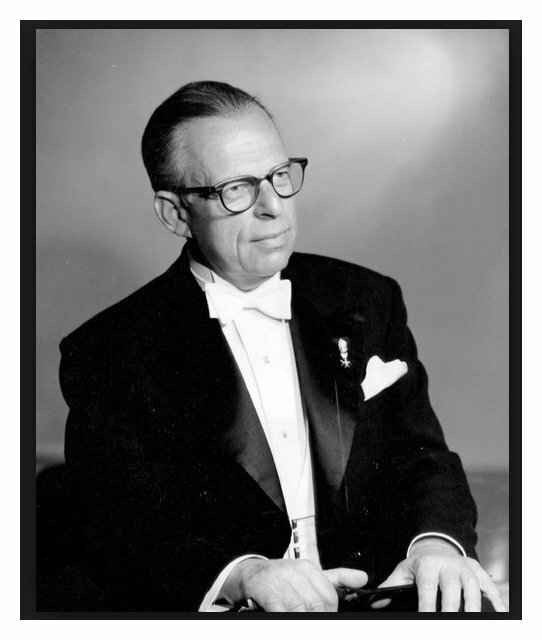 During his tenure with the company, Mr. Adler shaped it into one of the leading opera ensembles of the world. The San Francisco Opera was founded in 1923 by Mr. Adler's predecessor, Gaetano Merola, who had a natural predilection for Italian repertory. Mr. Adler brought a different spirit, more oriented toward German repertory, modernism and innovative stage direction. He expanded the repertory, introduced many young singers both European and American, developed summer, apprentice and touring programs and presided over a vast expansion of the season and the budget. 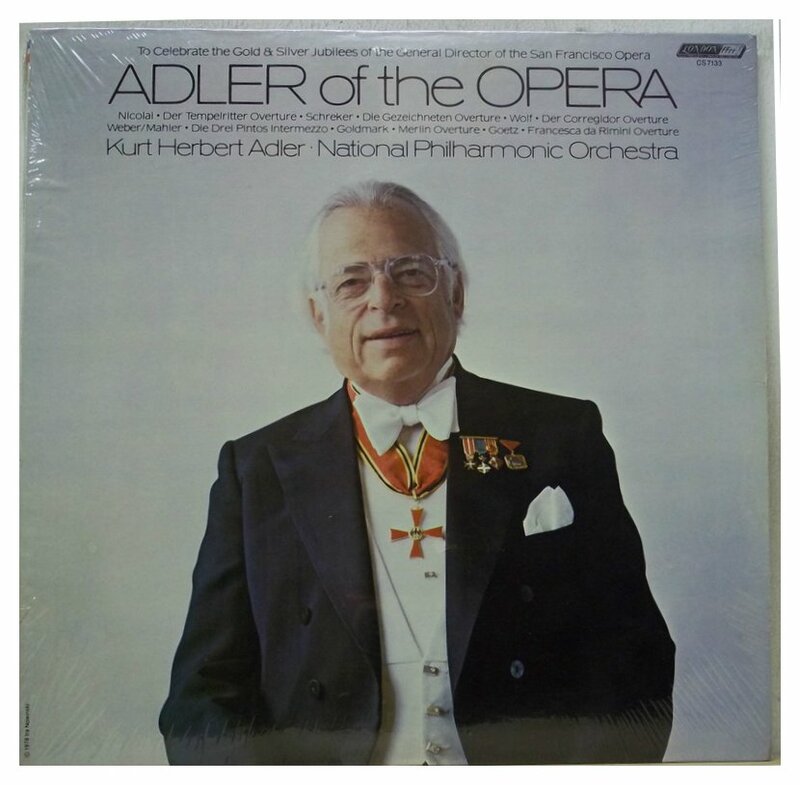 An imperious, crusty figure who involved himself with every aspect of the company's operations, Mr. Adler personified opera in San Francisco during the 1950's, 60's and 70's. A brooding bust of the general director, arms crossed and scowling like Beethoven, was installed in the lobby of the War Memorial Opera House long before his retirement. Born in 1905 in Vienna and educated at the academy and university, Mr. Adler made his debut as a conductor in 1925 at Max Reinhardt's theater in his native city. He subsequently conducted in opera houses in Germany, Italy and Czechoslovakia, and assisted Arturo Toscanini at the 1936 Salzburg Festival. Emigrating to the United States in 1938, initially for an engagement at the Chicago Opera, he became a United States citizen in 1941. In 1943 he joined the staff of the San Francisco Opera as chorus master, at first commuting from New York. He was appointed artistic director in 1953 and general director in 1956. Following his retirement on Dec. 31, 1981, he was named general director emeritus. When Mr. Adler took over the company in 1953, its season lasted five weeks. At his retirement, it stretched from Labor Day through December, with added spring and summer seasons. 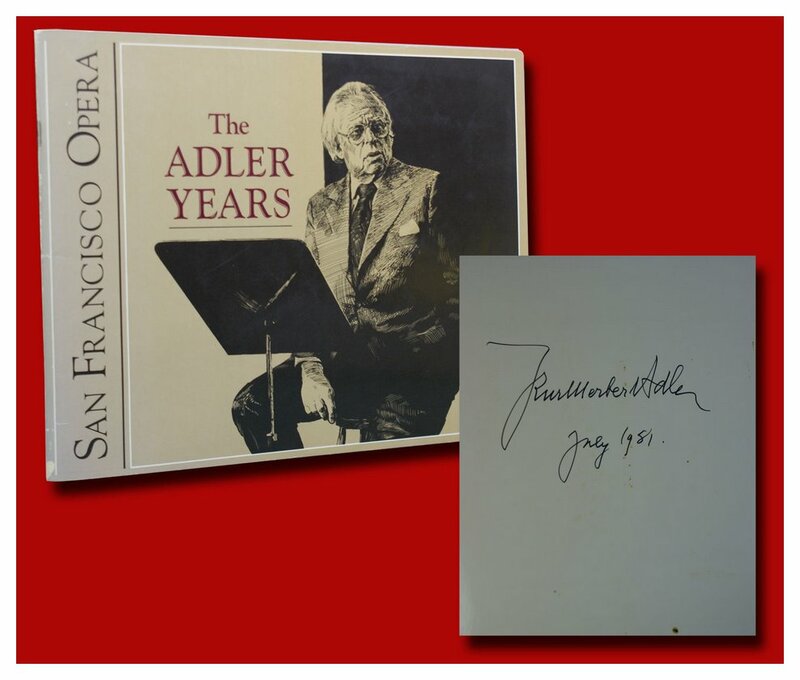 More than 300 singers, conductors, directors and designers made their American debuts with the San Francisco Opera under Mr. Adler's auspices. They included Boris Christoff, Geraint Evans, August Everding, Tito Gobbi, Sena Jurinac, Pilar Lorengar, Mario Del Monaco, Birgit Nilsson, Jean-Pierre Ponnelle, Leontyne Price, Margaret Price, Mstislav Rostropovich, Leonie Rysanek, Elisabeth Schwarzkopf, Giulietta Simionato, Georg Solti and Renata Tebaldi. Although he was primarily an administrator during his years as director of the San Francisco company, Mr. Adler also conducted occasionally. He continued to guest-conduct periodically after 1981, in San Francisco and elsewhere, and taught at San Francisco State University. His awards and honors included the Star of Solidarity from Italy, the Officer's Cross of West Germany and the Great Order of Merit of Austria. Mr. Adler is survived by his wife, Nancy; two daughters, Kristin Krueger of Clayton, Calif., and Sabrina, of Ross; two sons, Ronald, of Munich, West Germany, and Roman, of Ross, and two grandchildren. When one thinks of the San Francisco Opera, thoughts almost automatically turn to the man who guided the house for so many years, Kurt Herbert Adler (Vienna, April 2, 1905 - Ross, CA, February 9, 1988). He must not be confused with another Kurt Adler (Jindřichův Hradec, Bohmeia March 1, 1907 - Butler, NJ, September 21, 1977), who also started as a choral director and then became a conductor. 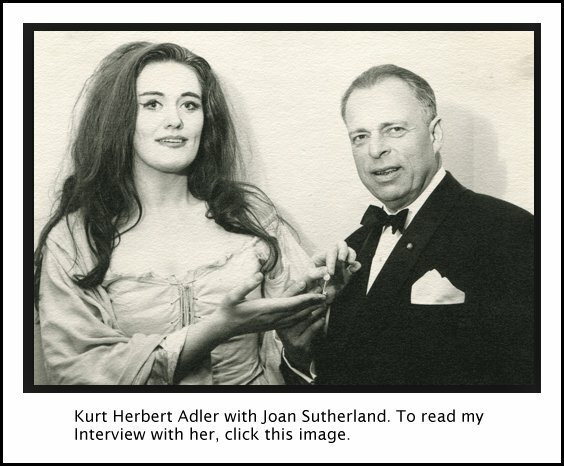 Indeed, many performances at the Metropolitan Opera list Kurt Adler as conductor, but for the purposes of this interview, he is the other one! 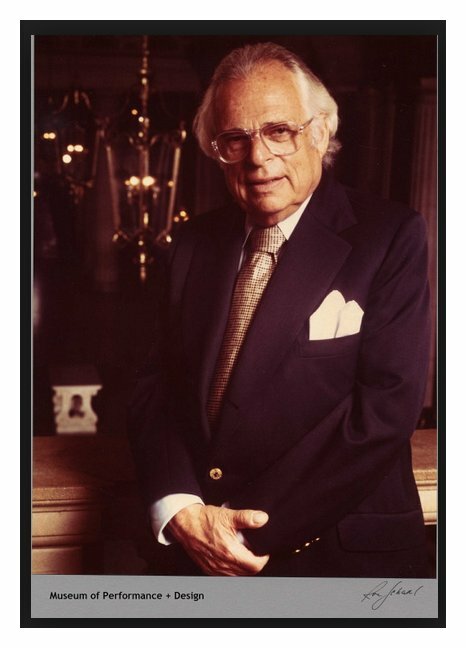 And since this page is about opera, I should also mention another conductor with a similar name and background, Peter Herman Adler (December 2, 1899, Gablonz an der Neiße, Bohemia – October 2, 1990, Ridgefield, Connecticut) who was Music and Artistic Director of the NBC Opera Theater (1950-64). He was a pioneer of televised operas, and commissioned Gian-Carlo Menotti (Amahl and also Maria Golovin), Norman Dello Joio (Trial at Rouen), Bohuslav Martinů (The Marriage), Jack Beeson (My Heart’s in the Highlands), Pasatieri (Trial of Mary Lincoln), and Hans Werner Henze (La Cubana). Peter Herman Adler was also conductor of the Baltimore Symphony (1959-68) and conducted the U.S. premiere of Macbeth by Bloch at Juilliard in 1973. He also adapted the music for the film The Great Caruso for which he received an Academy Award Nomination. Now back to Kurt Herbert Adler. He was born in Vienna and educated at the Musikakademie and the university there, making his debut at the age of twenty conducting the Max Reinhardt Theater. He rose through the ranks, and, like so many others who were being persecuted in Europe at that time, he came to the US in 1938. First in Chicago, then in San Francisco, he left his mark on many productions, and made the company of the City on the Bay his own. As he mentions, the administrative duties took him sadly away from the pit, but he did manage to conduct several productions throughout the years, and returned to the baton after retiring from the post of General Director of the company. His work earned him recognition both in America, and also from the governments of Italy, Germany, Austria, and Russia. It was in October of 1986, when he was preparing a revival of Die Meistersinger [with Hans Tschammer, Cheryl Studer, James King, Michel Trempont, Kurt Rydl, David Gordon, John Del Carlo, and Sandra Walker], I was able to persuade him to spend an hour on the phone for a chat about our favorite subject. Knowing that it would be published in Wagner News, we spent considerable time on Wagnerian topics, as well as the joys and sorrows of being the top man of the organization. Here is much of that very enjoyable conversation . . . .
Bruce Duffie: Let’s begin with the opera you’re working on right now. What are the special problems and pitfalls of doing Wagner’s only comedy? 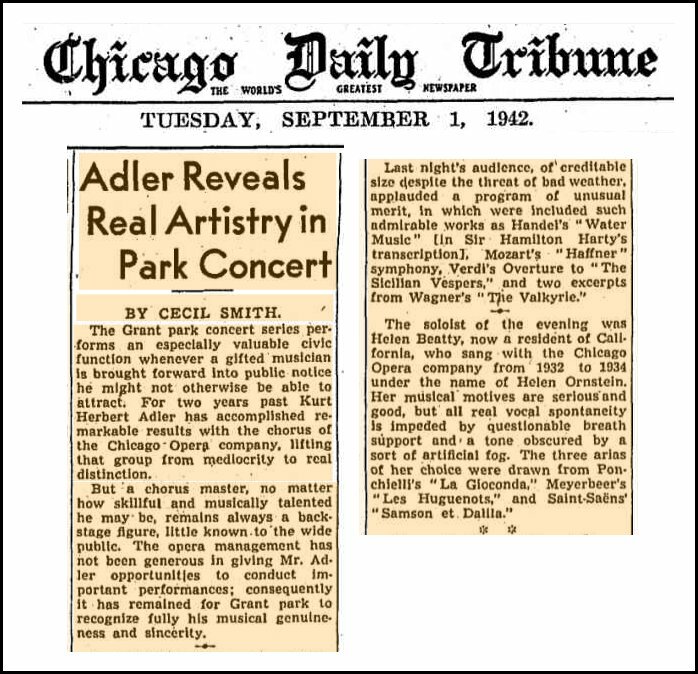 Kurt Herbert Adler: First of all, let me tell you that when I came to Chicago in 1938, the first thing they asked me to do at the opera was to prompt Meistersinger. I had never prompted any opera before, but I’d conducted Meistersinger a couple months previous to coming to Chicago, so I agreed since the cast were mostly friends of mine. I had been assistant to Toscanini in 1936 in Salzburg. BD: So you learned it under him! KHA: Yes. Well, I had better have known it before I got to Salzburg! But I certainly learned a lot from him. There were four assistants in 1936 — Solti, Leinsdorf, Laszlo Halasz (who later founded the New York City Opera), and myself. I still have the score which I used then, which has remarks made during rehearsals by Toscanini. One thing which stuck incredibly in my mind was that the dynamics in Meistersinger, more than in any other Wagner opera, are piano, crescendo, piano. The orchestra was not used to so many pianos. No orchestra in the pit would be, but especially the Vienna Philharmonic. So Toscanini worked very hard with them on that, and at the same time he had an incredible knowledge of the text. I remember that he showed the apprentices how to jump. The stage director was Herbert Graf, but Toscanini got involved in everything. The cast included Lotte Lehmann and Kirsten Thorborg. Schorr was supposed to be Sachs, but he came late and he “marked” during the first dress rehearsal, and Toscanini was mad. He wanted Schorr to sing out fully. Schorr said he couldn’t, so Toscanini demanded another Sachs. In Germany at the time were two of the world’s greatest Sachs’s, but the government wouldn’t let them sing with Toscanini because of the political situation. So in came Hans Hermann Nissen. Toscanini was asked later if Nissen had been a good Sachs, and Toscanini replied that he had a very nice face! Charlie Kullman sang his first Walther von Stoltzing, and there was a great deal of work to be done. He had to be brought into the role. 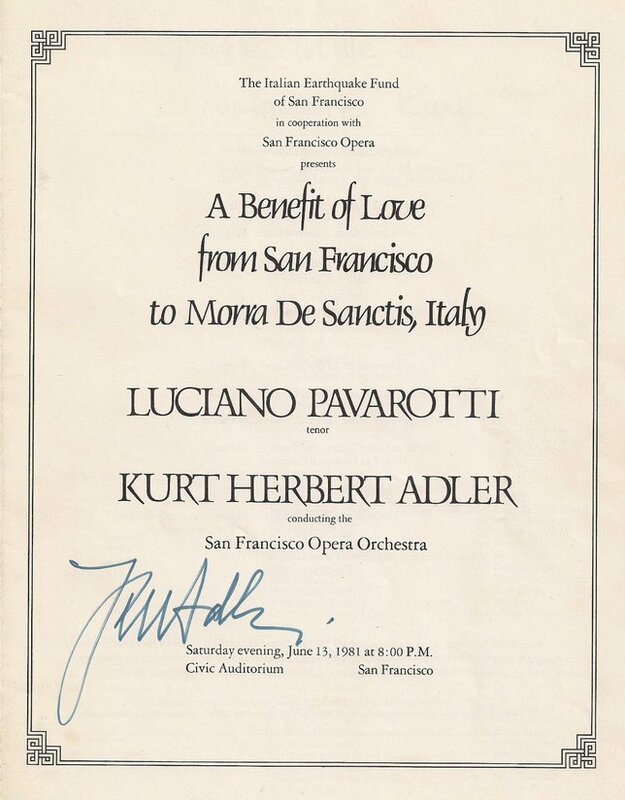 Interestingly, when I came to San Francisco in 1943, the first opera I conducted was Cavalleria Rusticana, and at that performance Charlie Kullman sang his first Turriddu. He did very well, and stayed on the upper level of international opera for the rest of his career. BD: Coming back to Meistersinger, is it fun doing a comedy that is as deep as Wagner has made it? KHA: Absolutely. It is mixture of some serious and some comedy. It is the only comedy that Wagner wrote — at least voluntarily. BD: Is it too long? KHA: It is a very long piece. I remember performances under Knappertsbusch and Keilberth in Munich which lasted close to six hours. I use a couple of minor cuts, and mine runs about 5 hours. BD: So why the cuts? KHA: They had already announced the starting time and printed the tickets, so I had to make cuts. It starts at 7 pm and ends close to Midnight. BD: Would you have preferred to start at 6:30 and have no cuts? KHA: I think so. It’s never been done here completely uncut, but I think the public would accept it. But it is long. BD: In a work running several hours, I often wonder if cutting a few minutes here or there makes any real difference. KHA: As you know, Wagner has some fairly large passages which are repeated. For instance, in the first act when Walther is being introduced to the Masters, there is a march-like passage that comes twice in just a few minutes. So I just do it once. The cuts I use are the ones used years ago in Vienna. They did not do it uncut, in fact they made more cuts than I am using now. It was one of the first operas I heard when I was 8 years old. So I grew up with it. BD: Did Toscanini make any cuts in the score? KHA: Nope. On the other hand, he and Graf argued whether Wagner meant ‘stage-right’ or ‘audience-right’. BD: This brings up the whole discussion of productions, and the ‘far out’ ones these days. How slavish should directors and designers be today to what is in the score? KHA: It depends to some degree on the composer and the writer, but we probably can assume that if they had lived longer, they would have used a different approach. There is no doubt that the tempos under Hermann Levi were different than they are now. I remember in the very early 30s – 1932 or 33 – Praetorious made the new production of the Ring in Bayreuth. He gave lectures at the various Wagner Societies, and I had a long talk with him. He said that Wagner was an extremely progressive person. There is no doubt that Wagner would have wanted to use the achievements of contemporary stage technique. Liszt took 100 rehearsals for Lohengrin. Now this is neither possible nor necessary. The musicians have assimilated Wagner’s style, but they had to work on it back then more than we do now. BD: Are we getting the same kind of thing today? Do contemporary operas need so much time to get up, but in the next century they might be done with only two or three rehearsals? KHA: Nothing should be done with only two or three rehearsals, but I know what you mean. Today, many works are considered masterworks which failed at the first performance. We don’t know what ones will survive and be popular, or considered masterful 50 or 100 years from now. BD: Is it still the obligation of the opera houses around the world to put on works which may or may not become masterpieces? KHA: Absolutely. If you don’t put on other works, then you won’t find the creators to do them at all. Even now, it’s a problem to find people to write operas. It takes much more time, and in many ways more knowledge to write an opera than a symphony. The National Endowment for the Arts, of which I was a member for six years, is trying to promote American opera. BD: Is it a mistake for the public to expect each new opera to be a masterwork? KHA: I think so. It never was and never will be. If an opera conductor thinks a work is worthwhile, he should do it. BD: What do you look for when you say ‘worthwhile’? KHA: You raise this question very well, but it isn’t easy to say what is of musical value, what is of dramatic value, what is of theatrical value. I’ve been involved in the American Opera Project where you can experiment and take the chances that you cannot do if you expect to keep the large theater solvent. BD: For a long time, you were an administrator as well as a conductor. Were the decisions you made as management those you’d like to have made as artist? KHA: You try to combine as much as possible, but at times you cannot do as an administrator what you would like to do as a conductor. Obviously, economics enter into this. BD: Were there times that the economic problems were too hard to get around? KHA: Sometimes, yes. On the other hand, I am proud to say that the public at the San Francisco Opera has confidence in the administration. The attendance for a contemporary work is not much lower than for a standard work, and the board did not stop me from doing some new works. The public went along with the contemporary works, and sometimes they liked them, sometimes they didn’t. There was the advantage that I was there for so long. I was General Director for 29 years, so they could get used to my ‘experiments’. BD: As the top administrator, how did you decide which operas you would conduct, and which ones you would ask guests to do? KHA: I did not do much conducting when I was involved with administration because I got stuck with fundraising. That took an undue amount of time, and it was not what I really wanted to do. But fundraising, union business, contracts, etc., took so much time that I didn’t have as much time for conducting as I would have liked to have. Now I would like to do even more conducting than I am, but I am much better known as an administrator. I’ll get to do more if I live long enough. I hope I get to come back to Chicago because my first stint in America was there from 1938-43. I conducted operas at the Opera House, and also concerts at Grant Park on the lakefront. BD: Tell me a little about the Chicago Opera Company during those five years. KHA: Those were difficult years. During those five years there were four different General Managers. That is not good for an organization. The last was Fortune Gallo (of San Carlo Opera Company fame), and he tried to economize where he could. The results were not very desirable. He was a shrewd man, but he cut costs, I feel, not always where they should be cut. BD: Did you take that experience with you to San Francisco and not make the same mistakes? BD: Where are the young managers coming from today? KHA: That is a good question. There are very few. BD: Then let’s go back to the musical side. Where are the young conductors coming from today? KHA: That is also a question. We had to start our careers as coaches or choral directors and work behind the scenes. That was very important. BD: Are the younger ones today not willing to spend that kind of time training? KHA: I don’t know if they are unwilling, but they don’t have the opportunity. They try to go very fast. Even someone like James Levine is a fabulous talent and does very well for opera, but once in a while it shows that he has not had the backstage training. He is one of the best these days, though. BD: So the conductor must be the master of all things onstage and backstage? KHA: He should. In my first engagement, I started with Max Reinhardt and Otto Preminger in music for dramas. After three years I did my first opera, and the director didn’t much care for administration. So the 23-year-old secretary in her second year there, and myself, also 23 and in my first year, ran the theater. I learned it the hard way. The city in 1925 was still occupied by the French from the First World War, but there was plenty of money from the city, the state, and from the federal government in Berlin. I have rarely worked in a theater where there was so much money available. Today, some theaters get perhaps too much money because they don’t use it too well. BD: Do you get enough rehearsal time for your operas these days? KHA: Yes and no. Meistersinger is a five-hour deal, so it’s hard to get enough rehearsals for it. But the singers don’t want to come for long rehearsal periods. In Europe, if a production rehearses for several weeks, the singers can sing other operas and earn money. Here that is not possible because there is no running repertoire. There have been lots of discussions of paying singers performance fees for rehearsals. BD: Is it possible for any opera to be over-rehearsed? KHA: I have not seen one in a long time, if at all. There is no ensemble-theater anymore, so I don’t think it could happen. BD: You’ve been working with singers for 60 years. How have voices changed in that time? KHA: I don’t know if the voices changed, but the professional life of the singers has changed. They sing more now and travel more. Arriving at the last moment and singing performances is not good. The singers are not acclimatized to the theater, the orchestra, the conductor, their colleagues, whatever. And let’s face it, but public everywhere wants star names, and the stars won’t sit so long. Some years ago, Karajan wanted to cast a few operas with big names, double or triple castings, and take the productions around the world. Even then it didn’t work because the singers didn’t want to sing so few roles. However, the repertory of singers is much smaller than it used to be. BD: So how do we get them to learn more roles? KHA: Patience. I’ll tell you something... patience is one of the things nobody has in this business. I told them in Washington for this American Opera Project, that it needs not only talent, it needs also patience. It will take years until we find masterworks. But I have always been an optimist. If you are not an optimist, you’d better not work in opera. BD: Let’s get back to Wagner a little bit. What other operas did you conduct? KHA: I did Tristan recently, and I did Flying Dutchman, though not in San Francisco, and I did Lohengrin. I am sorry to say I did not do the Ring. I also did not do Parsifal. I got into the music business when I was 13 years old. I sight-read the score to Walküre. I’d never heard it, and the man who heard me told my mother that I’d better go to a good teacher. I regret that I’ve never conducted that one, and I really know it very well. BD: Is there any other composer besides Wagner that you put on that same level? KHA: Not that they were alike, but Mozart certainly is a treasure. Beethoven as a dramatic composer is under-rated. BD: Does his opera, Fidelio, require Wagner-type voices? KHA: No. It depends on how you conduct it. BD: Let me ask you about doing opera in translation. Does it work? KHA: It depends. It is preferable not to translate, but, for instance, when we did Wozzeck, we did it a couple of times in English to help get the public get used to it before we did it in German. The same holds true for Lulu, Katerina Ismailova of Shostakovich, Katya Kabanova of Janáček, etc. BD: Do you like this new gimmick of supertitles in the theater? KHA: Absolutely not. I don’t like it at all. It distracts the audience. They watch to get the action, and they don’t listen any more the way they should. BD: You don’t feel the audience gains by being closer to the drama? KHA: No. I don’t think that’s what opera is all about. Even though operas are done in Italy and Germany for native speakers, if someone in Vienna tells you that he understood all the words in Rosenkavalier, he doesn’t tell the truth! You see, enunciation and diction change with the pitch, and not all singers sing all the time in their natural pitch. Your speaking voice is the natural pitch and everyone understands it. But when you sing, you can’t understand everything. You can make an effort to understand more than one does now because some performances are very sloppy, but as a solution for the spectator and the listener, the supertitles are not the solution for me. I feel it would be better to have better rehearsals for diction, and for the ticket-buyers to get better synopses and more printed information about the work you are dealing with. When I did the Ring here a few years ago, I gave out with the tickets a booklet which prepared the audiences. BD: Do you view the Ring as one long drama, or as four individual pieces? BD: How do you feel about the Flying Dutchman — is it better in one piece or three? KHA: One. I don’t think it needs an intermission. It lasts 2 ½ hours, but Wagner knew when he wrote it that it would be stronger in one piece. BD: One last question on distribution. How should a full Ring be played? KHA: When I grew up, it used to be Saturday Rheingold, Sunday Walküre, Wednesday Siegfried, and Sunday Götterdämmerung. The problem now is when people come to a city, staying eight days is a lot. But for four performances, eight days shouldn’t be too much. BD: I like Monday, Tuesday, Thursday, Saturday myself. As to the casting, is it good to put the same singers in different roles, such as Fricka and Waltraute, or Loge and Siegfried? KHA: I am against using the same singer in different roles on the same night. That I don’t like, but I don’t see why others such as you mention aren’t OK.
BD: What about different singers for the same role — more than one Brünnhilde or different Wotans as the Ring progresses? KHA: We are forced to do that nowadays sometimes because the voices don’t last. They cannot do three Brünnhildes in one week. Naturally, I would prefer to use one. BD: Tell me the secret of Tristan. KHA: Tristan is a primitive, sensual approach to music and drama. When I did it last, I had Gwyneth Jones, and she was sick for part of the time, and only when she went to the Met did she master the role. I understand she’s quite good in it now. Some of the tenors now can sing most of the notes, but whether they know what it’s all about, I am not so sure. BD: One last question. Where is opera going today? KHA: It’s in a turmoil, but opera has always been in a turmoil. Whoever invented opera is still suffering for it. I used to say that opera is a continual crisis, and if there is not crisis, you have to create one. It’s not a simple matter. At this point, I thanked him for the conversation and for all of his work, and wished him every continued success. This conversation was recorded on the telephone on October 11, 1986. The transcription was made, and it was published in Wagner News in November, 1990. It was slightly re-edited, the photos and links were added and it was posted on this website in 2016.